Supersub Henry Jones netted a late equaliser as AFC Fylde secured a well-deserved point in a thrilling 2-2 draw with in-form Eastleigh. 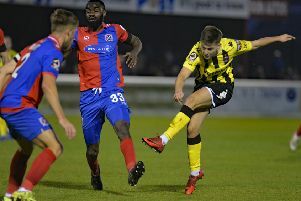 Ryan Broom had looked to have handed the south coast outfit a fifth win on the spin with a fine double either side of Zaine Francis-Angol equaliser before Jones had the final say on his return from injury. Manager Dave Challinor made one change to the Fylde side that tasted defeat at Woking last time out with Callum Chettle, who scored in the midweek Lancashire Cup win over Oldham Athletic, replacing Sam Finley. Eastleigh midfielder Ayo Obileye was the first to threaten when he launched a powerful drive towards goal that was diverted around the post by Sam Stubbs, before flashing a header wide. Brilliant interplay between Francis-Angol and Jonny Smith teed up Andy Bond on the edge of the area but the midfielder took too long to get his shot away. It took Fylde until midway through the half to really test the Spitfires when Smith cut in from the right and curled an effort narrowly widet. No sooner had Fylde started to find some rhythm and it was Eastleigh who broke the deadlock. A long ball over the top was judged perfectly by Broom, who nipped between the centre-halves and swept the ball into the bottom corner. Smith almost found an immediate reply when he lashed an effort across goal that looked to be arrowing towards the bottom corner but drifted inches wide. The Coasters had claims for a penalty when Lewis Montrose was brought down inside the six-yard box; however referee Glen Hart was having none of it. Fylde were really starting to knock on the door and, when picked out by Francis-Angol, Smith should have done better than scuff his strike at Graham Stack. Fylde full-back Luke Burke fizzed another inviting ball across goal as the hosts’ momentum continued to grow. Danny Rowe came close to bringing the scores level with the last kick of the half, sending a 20-yard free-kick whistling past the near post. The Coasters picked up where they left off after the break, Stack tipping over Jordan Tunnicliffe’s looping header before watching on as Rowe’s first-time strike trickled just wide. There was a welcome return to action on the hour for James Hardy and Jones – and it was the latter who helped drag the hosts back into the game. The Welsh winger whipped in a delightful ball from the right and the unlikely figure of Francis-Angol ghosted in to poke home. However, the celebrations were cut short just three minutes later when a ball forward was misjudged by Stubbs and there was Broom once again to nip in and lift a sublime effort over the advancing Jay Lynch. The two home substitutes were making a real impact and linked up well with 20 minutes to play, Hardy crossing for Jones who could only find the goalkeeper’s grateful clutches with his volley. Fylde launched a late onslaught that eventually paid dividends in the final five minutes. A sensational Hardy cross from the left was flicked on by Jack Muldoon to the back post where Jones was lurking to nod the ball into the far corner. AFC Fylde: Lynch, Burke, Tunnicliffe, Stubbs (Tasdemir 75), Francis-Angol, Montrose, Bond, Chettle (Jones 58), Smith (Hardy 58), Muldoon, Rowe. Subs not used: Grand, Taylor. Eastleigh: Stack, Hoyte, Togwell, Cresswell, Wood, Constable, Broom, Obileye (Miley 77), Boyce, Williamson, Matthews. Subs not used: Yeates, Read, Shaw, Childs.